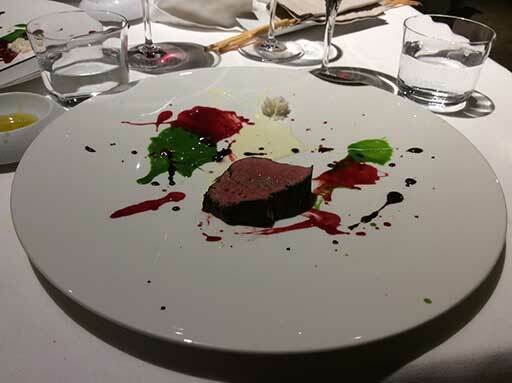 The Beautiful, Psychedelic, Spin-painted Veal, Not Flame Grilled is darkly caramelized on the outside, and painted with colorful and seemingly random (although carefully calibrated) pastes of vegetable and herb purée. This dish was prepared with the sous-vide method of cooking, which is done by immersing a sealed package in a closely controlled water bath. Meat can be cooked for hours or even days using this technique without losing flavor or texture.